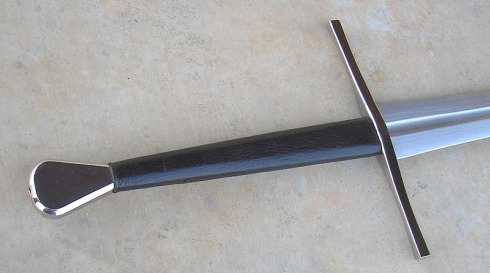 The Tinker Longsword, designed by Michael "Tinker" Pearce and brought to life by the Cas Iberia/Hanwei Forge, is part of the current 'renaissance' of medieval swords - swords designed to handle and perform like the originals did. 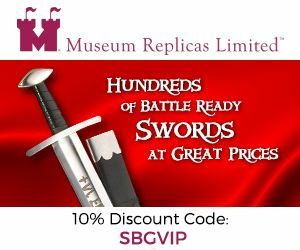 However, despite an excellent design, these swords went through a fairly rough trial period and were probably never quite as popular as they should have been.. 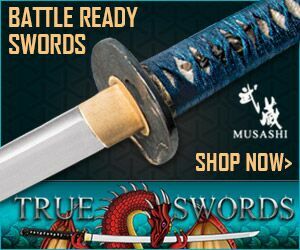 In this hands on review with one of SBG's most respected and experienced collectors of medieval swords, 'Shooter' Mike Harris from Texas, we take a close look at this sword - both the good and the bad - and let you decide..
Because the reality is, this is perhaps the best sub $300 longsword currently on the market...! It's no secret that Michael "Tinker" Pearce has been designing swords that will be produced by Paul Chen in China and sold through CAS/Hanwei. 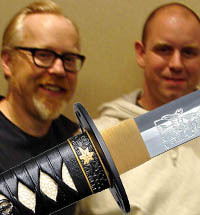 This was the first sword design from that collaboration to become available to the market. 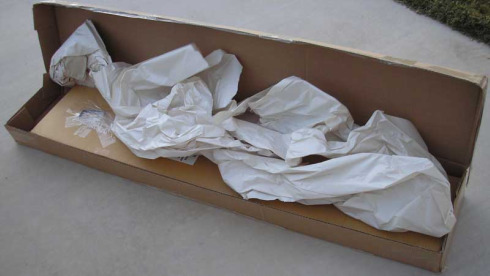 The sword came in an indestructible package consisting of a box for the sword, packaged inside a larger box with additional padding. 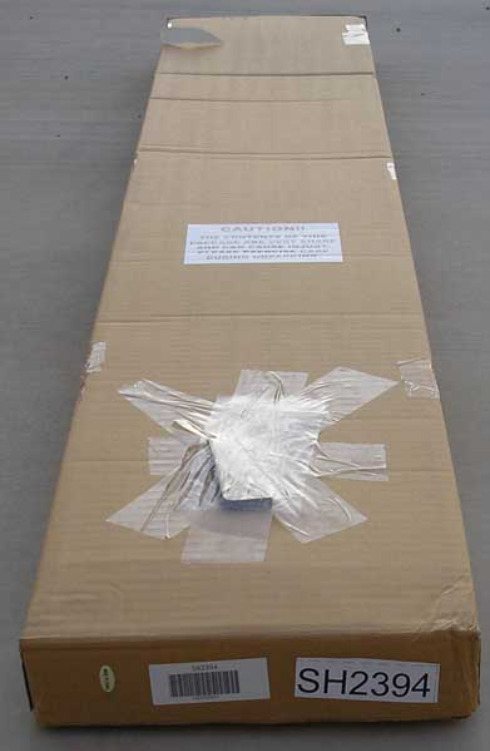 Seen here, the inner box came with a 5mm Allen wrench taped securely to the inner box. 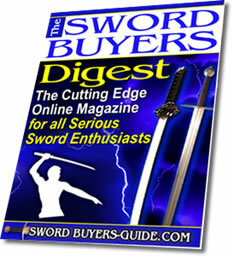 This is a very nice addition and a big help for maintaining and adjusting the sword's hilt. 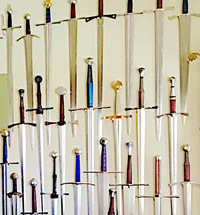 The sword is a late medieval longsword design. This design was intended mostly for civilian use in dueling and self-defense. As such, it is meant to be a fairly light-weight sword with a long grip and moderately long blade. Speed and point control were two of its greatest assets, as it was primarily intended for unarmored combat. The 35 inch long blade has a short fuller that begins about 1/4 inch wide and tapers gracefully to about 1/10 inch wide at the tip before slowly fading out onto the blade surface. It begins on the tang and runs under the guard and down the blade for 11 inches. The sides of the fuller are straight with a faint hint of waviness, and very "hand-made" looking in a pleasing sort of way. They definitely don't exhibit the artificially crisp or machine-perfect lines to hint at modern CNC milling and detract from the historic look of the sword. The remainder of the blade exhibits a pleasing flattened diamond profile that is more hinted at than pronounced, more like a period antique than a modern machine-made blade. The finish is the typical CAS/Hanwei brushed satin finish. 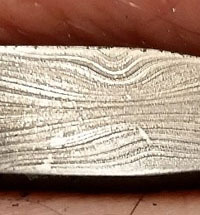 It is extremely even and shows no variation at any point over the entire blade surface, except where a small secondary bevel is present from sharpening. "Complex geometry" is the best way I can think of to describe the blade shapes and proportions. It is just over 2 inches wide at the guard and tapers noticeably for the first 2 inches or so, forming a "flared shoulders" profile. The blade then tapers more or less uniformly to within about 5 or 6 inches of the tip. Here it radically tapers again to form a relatively thick, narrow point that's best described as awl-shaped. Starting at 0.250" thick at the guard, the blade distal tapers gradually to the end of the short fuller. Then the distal taper increases on something of an outside curve until about 4-5 inches behind the tip. The last 4-5 inches of the blade are radically distal tapered to the tip, still following more of a curve than a straight line. I would describe this as a "complex convex distal taper" as the angles gradually shift at various points along the blade, with the intention of building exactly what it is. 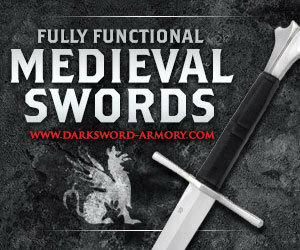 A longsword with complex and subtle handling attributes that are hard to describe, but easy to recognize when using the sword. With a forward node of vibration that actually forms a 5 inch long "dead spot" of no vibration when struck on the pommel, this blade promised to be something unexpected in cutting exercises. Sharpening, or lack of it, is the only place I can find fault with this blade. A very pronounced but small secondary edge bevel is very obvious. The bevel is very small because the included angle is almost 90 degrees. Realistically, it's about 80 degrees, with 40 degrees per side. This forms an extremely steep angle, and the edge was not what I would describe as sharp, even by European longsword standards. More about this later in the cutting section. The blade tang is thick and sturdy. The method of assembly utilizes a threaded tang and hollow tubular nut which fits completely inside the pommel. 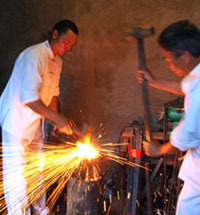 An added feature is that the guard has bee peened to fit very tightly to the tang when fully seated. It makes for a very sturdy, rattle-free hilt assembly. 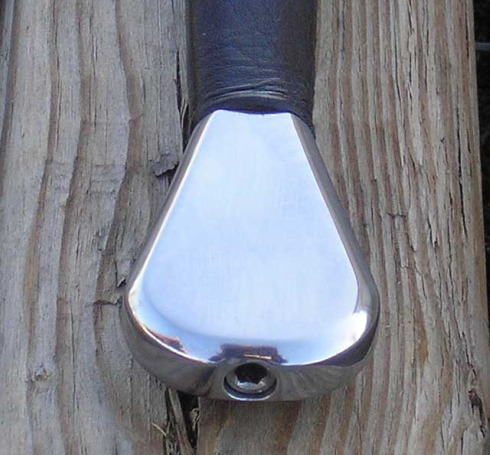 The highly polished guard and pommel set off the satin blade very nicely. The guard has the rectangular cross section of an Oakeshott style 2 cross, that is far from being blocky. Here again, complex lines and geometry are the order of the day. The center and both ends are about the same thickness. But the sides taper gracefully in a scallop shaped curve between the center and the tips to make for a very pleasing shape to the guard. 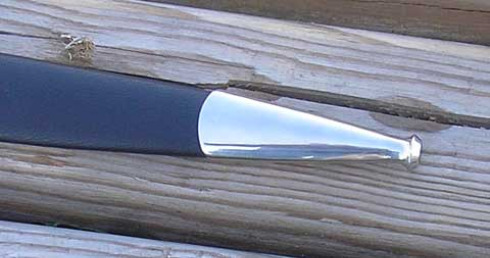 The pommel is an Oakeshott type T1 with a bevel that extends around the edges. It is secured by a recessed hollow hex head nut sized for a 5mm Allen wrench. The pommel is very smooth and makes a nice gripping surface. The grip is more or less rectangular, with the corners angled off to make an irregular octagonal cross section. It is covered with plain brown leather that is butted to form a very clean seam. The only minor annoyance with this leather covering was that it bunched a little at the pommel end when the pommel nut was secured fairly tightly. A nice scabbard is included with the "Tinker" longsword. It is standard fare for CAS/Hanwei medieval swords. Wood core with leather covering, a brightly polished throat piece and chape with a nice finial at the tip. It's very serviceable and attractive, and is quite the exception for a sword that retails for $359, but can be obtained from various vendors for substantially less. In fact, I can't think of another maker of medieval swords that consistently approaches the value and historical appropriateness of these CAS/Hanwei scabbards. There's something about this particular sword that "grabs you" when you first draw it from the scabbard and put it through some dry handling drills. While the sword weighs almost 3 lbs, I would have guessed it at barely 2 1/2 lbs. The balance is very neutral, making the blade move almost effortlessly. The tip stays on-line through extended thrusting without effort. It doesn't wiggle or wander like some swords have the tendency to do. Cutting swings can be controlled with ease. So much so that I found it no challenge to stop a full-speed cutting stroke within an inch of an intended target without any undo strain on my arms or wrists. I have handled several dozen longswords from various makers all along the spectrum of production swords, and I think this is one of the most controllable ones I have ever had the pleasure to experience. I initially had no success trying to cut with this sword as it came, due to the extremely steep edge bevel and the lack of sharpness. It was quite a letdown after how gracefully it handled. But any length of metal bar, no matter how expertly designed and manufactured, won't cut light targets without a serviceable edge. So, in short, I broke open a number of plastic bottles and jugs. I hacked at a number of tatami mat rolls. But I had little success actually cutting targets cleanly at first. This is not the first Hanwei-made European sword I have received that has been a bit lacking in sharpness. 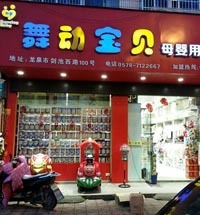 In fact, this keep up the 100% record over six swords. But knowing how well Hanwei swords work after a good sharpening, it warranted a trip to the shop for some file and sanding pad work. 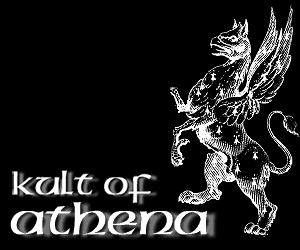 And this is where I learned another interesting and pleasant thing about this sword. IT IS HARD! They definitely got the heat treat done well on this blade. I had a new file and a lot of 400 and 600-grit paper, and it's a good thing. Because even with a new file and lots of 400-grit paper it took 2 hours per edge to get it just the way I wanted it. And after that effort I am happy to say this sword had a pair of edges that I would describe as being reminiscent of a nice katana edge with substantial niku or "meat" and it slices paper cleanly on both sides. Thus prepared, it was back to the cutting stand. I must admit that I was not exactly prepared for the difference having this blade properly sharpened would make. I was expecting only a so-so performance. Suffice to day, it was a very pleasant surprise, with plastic bottles that previously burst on impact being cleanly severed in an almost undisturbed fashion. And the previously resilient tatami mats being much easier to cut, whether on a cutting stand or simply free-standing on top of a bottle cutting stand. I also did some thrust testing on both tires and a large plastic garbage can packed full of cut up tatami remnants. The results were most impressive. With a few pushes, the blade was able to penetrate over 20 inches through two steel-belted radial tires suspended side-by-side on my tire pell. This photo shows the depth of penetration. Notice the highest rubber mark about 4 inches below the tip of the fuller. That's the depth of penetration through two tire sidewalls. Impressive. I am a bit overwhelmed by the handling and performance characteristics of the CAS/Hanwei Tinker Longsword. Is it for everyone?... Well... if they would make them properly sharp then I think everyone who is a fan of the medieval longsword would like one. That's the only flaw in performance that I can detect. Swords need sharpened edges. If you are willing and able to sharpen your own swords, then this is a good choice for you. If not, you could still get someone else to sharpen it for you, but that's your call. All I can add about this particular sword is, I'm glad I got it and I'm glad I went to the trouble to sharpen it properly, because it is a true joy to use now. 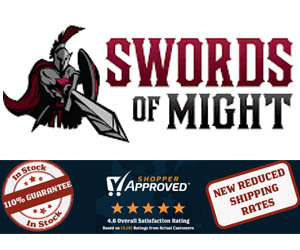 The price of this longsword has varied wildly since it was first released, but - as despite their imperfections - they are hands down the best handling medieval swords readily available at anywhere near this price point.